I heard this fabulous interview on Progressive Radio Network and thought, Holy Moly this is perfecto for my No Meat March peeps! 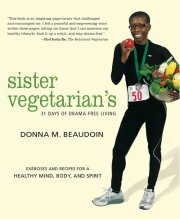 The guest on the first half of the show is the author of “Sister Vegetarian’s 31-Day Days of Drama Free Living,” and she hits on a very important point for first timers: The hardest part of becoming vegetarian is handling all of the drama and societal pressure that is suddenly hitting you from all directions. Your co-workers, family, and even strangers are going to begin to question and even try to discourage you. You may expect the hardest adjustment to be your new food choices, but eating and preparing delicious foods is for most the easiest part of the journey! Give the interview a listen while cooking, cleaning or pumping iron today and take the positive words of advice and encouragement to heart. I ordered the book right away – looking forward to taking the 31-day Drama-Free challenge myself when it comes in the mail! Peace, my Pea Peeps. And Happy Day 2 of No Meat March, my little Marchlings! UPDATE: The original link to the radio interview was broken and it has been corrected! ← Holla at me world!